Really happy to have a major improvement to the overall UI in this patch: a configurable outliner. Found in the upper-right of the screen, you can see a list of your various assets and projects. Currently it lists Armies, Followers, Workers, Recruitment and Construction. Categories can be collapsed by clicking them, and individual items act as links to the relevant entity or game window (e.g. the Military window for recruitment). You can customize what categories to show and whether to show headers, by right-clicking the outliner or via the game settings window. In addition to this new UI element there are some bug fixes and improvements, the most notable of which is the ability to drill down into pending recruitment details in the Military window. There is also a button to cancel a recruitment or summoning from here, recouping some or all of the cost, depending on circumstances. For the rest, notes can be found on the forums: Latest Release Notes. Finally, an update on the Early Access release date. The original target was mid to late January, but there are still some issues I want to address, so this has been postponed to a tentative date of February 15th. This time will be spent improving the game as usual, but also on setting up a good test environment for the MacOS and Linux/SteamOS builds. Apart from fixing an annoying blocker currently there for MacOS, I want to be sure I can respond quickly and efficiently to any technical issues encountered from the onset of Early Access. It’s been great getting feedback from the beta testers. The feedback has been honest, relevant, constructive and to the point. You have my thanks for your time and effort, and the ideas and requests already made manifest in the game will hopefully illustrate that tester and community involvement in this project goes beyond bug reports. I am excited and pleased to see how far the game has come. Even if there are many raw and unapproachable areas of the game still, there is a massive difference compared to early alpha versions, barely recognizable as a game despite the budding engine and world under the surface. Interesting times are coming – taking my vision for a deep, customizable and replayable Fantasy Grand Strategy game, and subjecting it to the harsh, but also incredibly inspiring, reality of actual players interacting with the development and playing the game as it evolves. Version 0.9.69 is on Steam now for the beta testers, please let me know about any thoughts, ideas or bug reports on the forums. This latest build, which should be on Steam for beta testers within an hour or so, has a mix of UI improvements and bug fixes. New quests and idle workers will now trigger notifications. Idle workers can be auto-assigned and new quests will link to the Quest Window. There is an expanded Quest view available now when clicking on a quest, which gives more details, including rewards. A new quest has been added to help guide players to begin searching provinces, for dungeons and other interesting sites. The battle resolution engine has been improved, with more unit abilities being considered, improved AI and some balance tweaks to make ranged attacks a bit more useful. As always there are the usual bug fixes and tweaks. The complete patch notes can be found on the forums. There will be a more comprehensive update on progress towards Early Access within the next couple of days, most likely accompanied by a new patch. A variety of new stuff in this build, in addition to the usual bug fixes. I have added some music to the game, some great scores by Vasco Grossman, which he kindly made available through the Unity Asset Store. The plan is to add more music (when budget allows for it), and make the playlist customizable by the player. 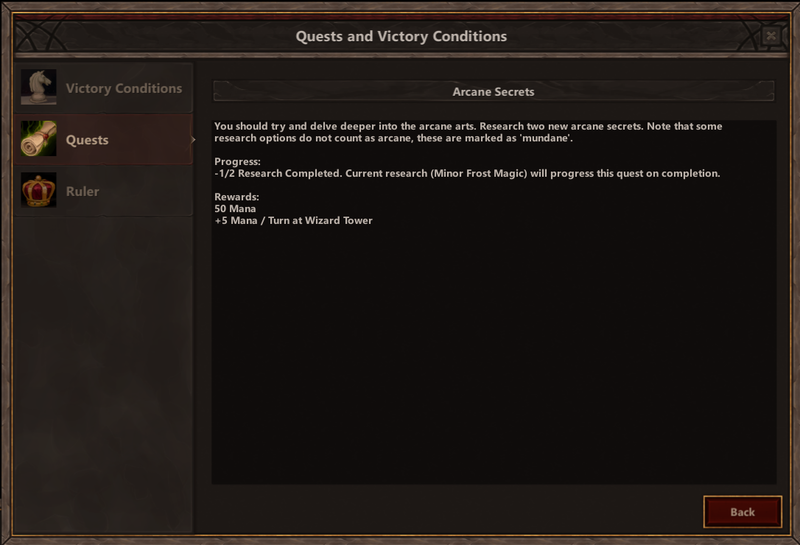 There is also a Victory Condition / Quest Window, which shows current quest objectives, as well as progress towards towards victory. Like many other parts of the UI, it is still a bit raw, but having this information available is yet another step towards making the game a bit less enigmatic to new players.I was really happy to finally have squashed enough bugs to be able to set aside the time for this. Another step towards making the game more accessible is the “rescaling” of resource values. This means scaling up a lot of values. For example: a unit that used to cost 0.65 gold to recruit and had an upkeep of 0.2 food and 0.01 gold, might now cost 650 gold with an upkeep of 1 food and 10 gold. The exact scaling factors vary a bit per resource, and I have tweaked a few costs at the same time. Finally, I have added more tool tips and missing information in various parts of the UI. Especially the buttons etc. relating to siege and assault of cities and fortresses have been improved to give more and better information about the mechanics. You can find the release notes on the forums. Latest build should be on Steam shortly. There are various bug fixes (mostly related to espionage) and some usability improvements. Navigating the main menus and windows should now be a better experience. There is also an option to auto-assign workers to sites once construction completes. If the max number of workers allowed after construction is lower (e.g. farms), the open slots will be filled from the top of the list of assigned workers. * Esc now closes open menus (research, recruitment etc). Opening a new menu now closes the existing one instead of leaving it open in the background (submenus excepted). * Fixed issue that could cause cancel of select army/city/character/etc prompts to freeze the UI. * Fixed bug where selecting a target and then cancelling could cause some actions to trigger anyway on the target, even if an invalid selection. The latest build will soon be live with some bug fixes and some additions to the UI. I am almost done with the initial flood of bug reported by the beta testers, after which I will move on to the most reported/most annoying usability and game play issues. I’d really like to do another video update, so I hope to find time for that soon as well, but making the build stable and at a decent level of usability is the primary focus. Producing a manual/tutorial/better in-game help is also a high priority, as that has been mentioned a lot by beta testers. * Units created by events now use the proper default numerical strength. Especially noticeable for rampaging monsters that will no longer consist of hundreds of dragons, manticores, etc. This should make the world a somewhat safer place. V0.9.64 is moving through the pipeline and onto Steam where it should be available within the next couple of hours (for beta testers). I didn’t make an update for 0.9.63 so I’ve appended the notes for that one. As you can see I have been focusing almost exclusively on bug fixes. I still have some items left on the known bugs list, and there are certainly bugs not listed/organized, but this build is a nice step towards better stability, so I can get back to working on the quest/victory window. Thanks to the beta testers who spent time testing the last few builds and provided really useful feedback and bug reports. * Some research options (so far leadership, diplomacy, minor binding and warding) double/half estimated turns when selected. * Inspect City was not opening the window. * Cast Spell was shown with no spells to cast. * Time on pending recruitment was incorrect. 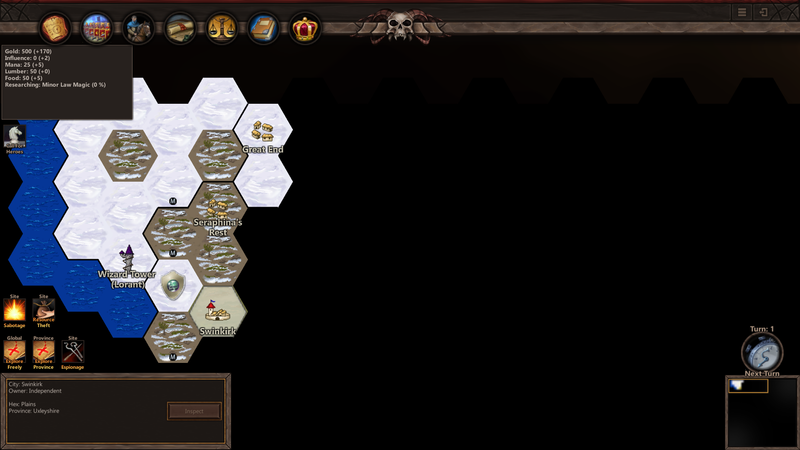 * Resource production sites now show expected resource production, not the production during the last turn. Previously changes to the expected production (for example by assigning or removing workers) did not reflect in the UI. * Back button added to spell icons, to get back to world actions.